In early October, my friend Alice told me about Groupon, a nationwide (but locally focused) daily deal offeror. By promising businesses a minimum number of customers, Groupon gets unbeatable discounts and deals on the best things to do in Manhattan (and several other cities) that can't be found anywhere else--they call it "collective buying power" (i.e., Group + coupon = GROUPON)! 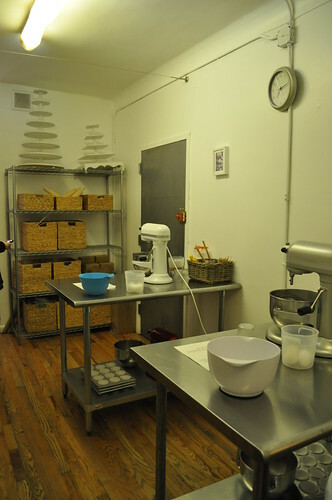 The specific Groupon she told me about was a deal on one cupcake class at Butter Lane (a $50 value) in the East Village at only $25! 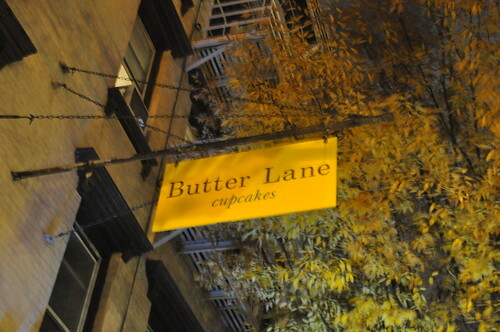 Butter Lane is one of my favorite bakeries in Manhattan (in fact, I used them to cater cupcakes at my birthday wine tasting last year), so I was sold. Each class lasts two hours with a total of 12 students, and each students gets to bring home a dozen cupcakes! Not a bad deal at $25! Outside Butter Lane's bakery on the left. The cupcake classes are located next door on the right. 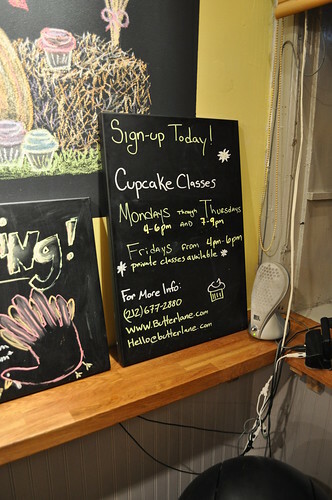 Advertising inside the bakery portion of Butter Lane for cupcake classes! 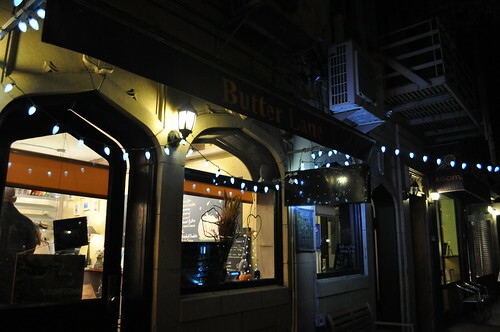 Inside Butter Lane's bakery! It's a small little place, but the cupcakes are amazing. Its focus is on pure ingredients (e.g., real vanilla beans, real cocoa, dark chocolate)--plus everything is organic! 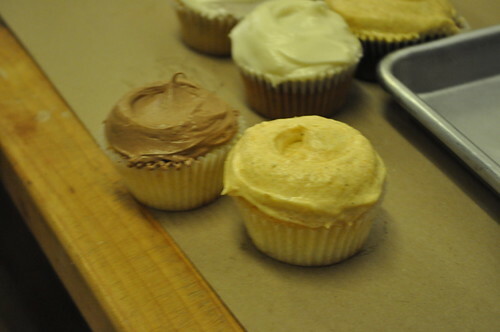 They also offer two types of buttercream, French and American, which makes them different from the typical cupcakery. 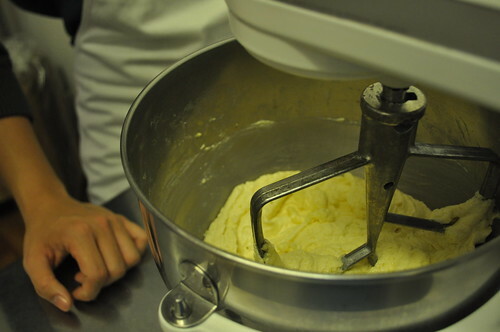 As the bakery describes, "French buttercream is made with egg whites, butter, and granulated sugar, while American buttercream is made with confectioners sugar and butter. 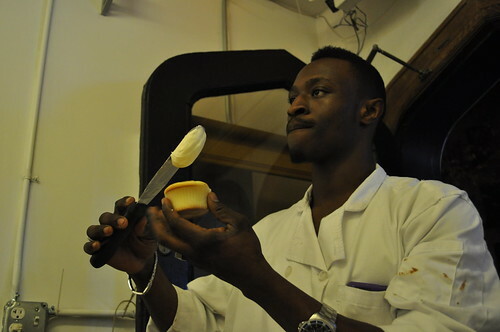 The French is more like a meringue while the American is like the familiar icing we all know." 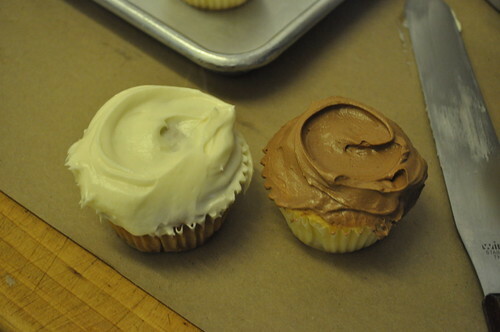 I actually prefer the French buttercream--it has a very rich lightness to it that I enjoy very much. 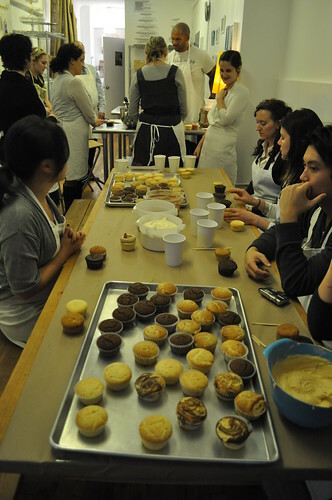 Alice and I signed up for a class on November 16, and once we got there, the bakery had cupcakes in the middle for students to nibble on before the class began. 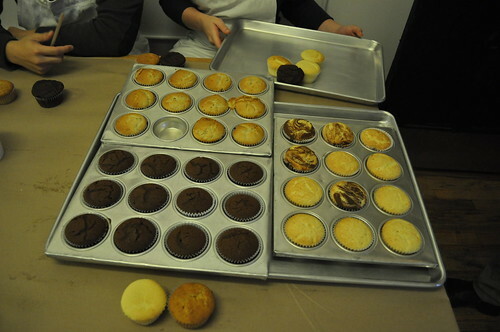 Once all the students arrived, the class was divided into three teams of four, and each team was assigned a cupcake type (vanilla, chocolate, or banana) and frosting type (vanilla, chocolate, or cream cheese). 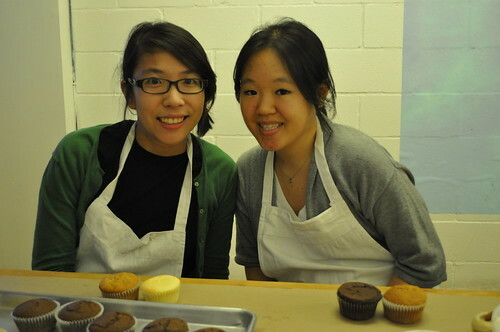 Our team consisted of Alice, myself, and a couple, and we were assigned banana cupcakes with cream cheese frosting. Thus, the name Team Banana came to be. Whoo! Team Banana figuring out how to operate the KitchenAid mixer. The first step was to combine 1/2 pound of butter and 2.5 cups of granulated sugar in the mixing bowl, combining until the sugar and butter form a cream. 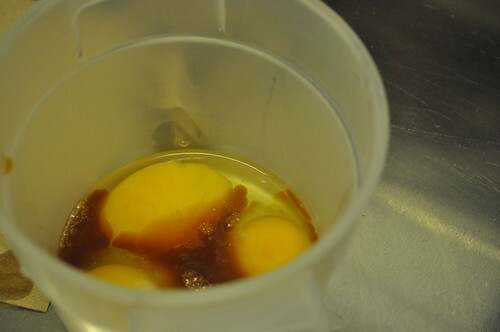 We then cracked three eggs in a separate bowl, adding a splash of vanilla extract to the eggs, then adding all of this to the mixing bowl. 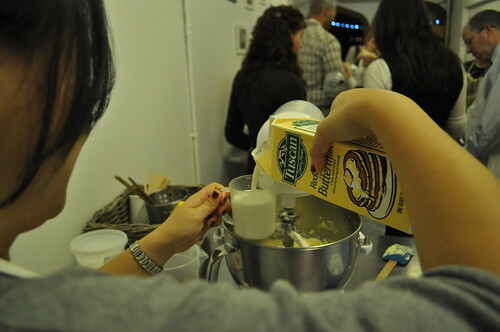 We had to mix this all on medium speed until the mixture became light and fluffy. 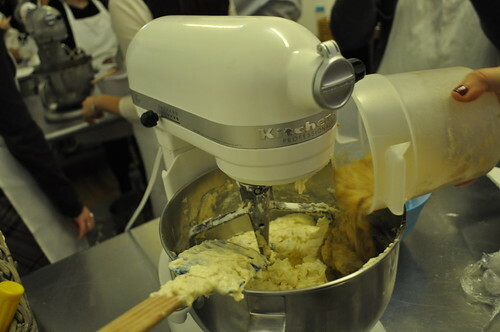 Our instructor told us that we could be very generous with the "splash" of vanilla--can never add too much as it adds a nice flavor to the cupcakes. 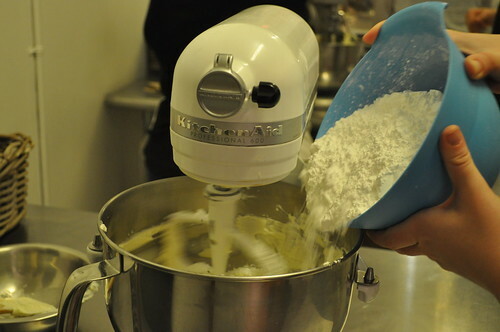 More ingredients: 3 cups of cake flour and 1.5 cups of buttermilk! 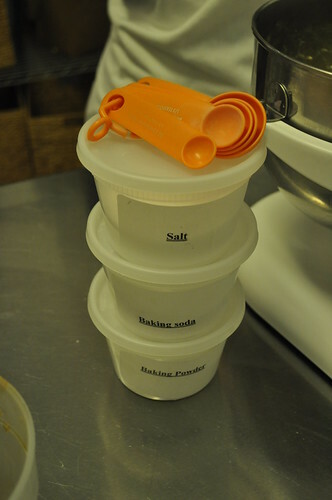 Next, we combined 1/2 tsp baking powder, 1.5 tsp baking soda, and 1 pinch of salt with the flour. 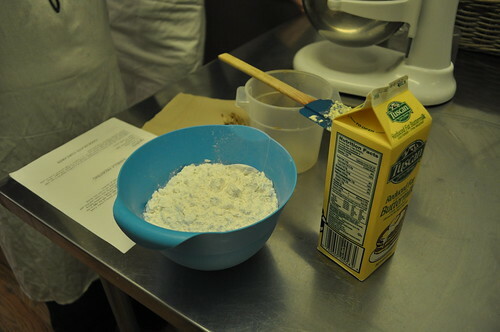 The instructor told us to add half of the flour mixture followed by the buttermilk, and then add the rest of the flour mixture to the mixing bowl. We then continued to mix until everything was combined, but wary not to overmix. On a low speed, we added 2 cups of puréed bananas, mixing for one minute. 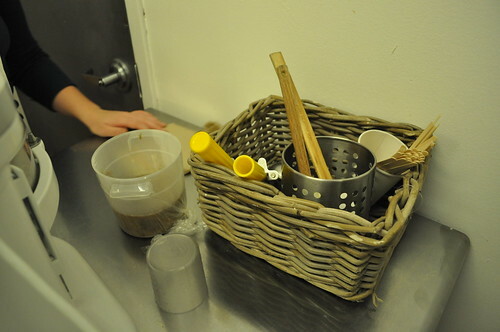 Then we removed the mixing bowl from mixer and finished mixing by hand. Next, we lined the tins with cupcake liners. 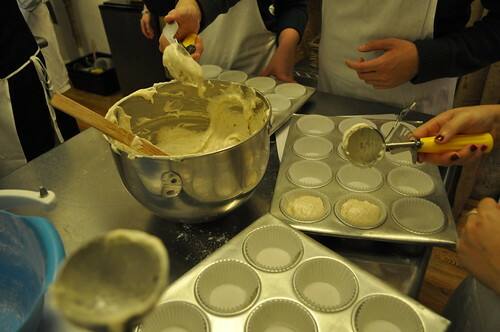 Using a spring-action ice cream scoop, we scooped the batter against the side of the mixing bowl so that the amount scooped didn't overflow the scoop, thereby fitting nicely in the cupcake liner in the tin. Great technique! P.S. the recipe I just recited yields 30 cupcakes! Alice's completed cupcake tin. Look at how perfect the scooped batter looks here! My completed cupcake tin. Major FAIL on my end. I can cook very well, but I admit that baking may not be my strongest suit. I need some practice scooping, that's for sure! Team Vanilla, Team Chocolate, and Team Banana group photo before placing the cupcake tins in the oven at 300°F for 23 minutes! 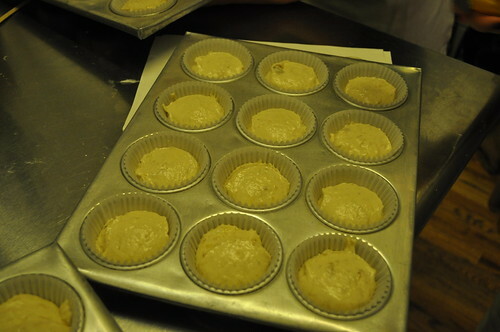 While the cupcakes were baking in the oven, Team Banana began making cream cheese frosting. Here's the 16 ounces of cream cheese needed! 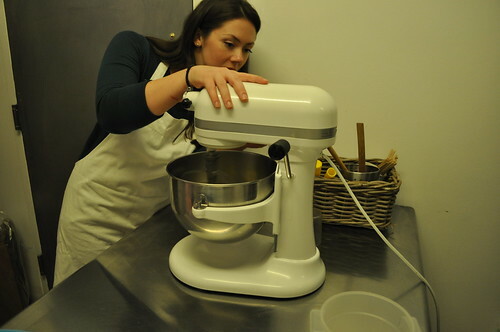 The instructor emphasized that Butter Lane's focus is NOT on sugar, but on cream cheese, which explains why the bakery's buttercream is so amazing! 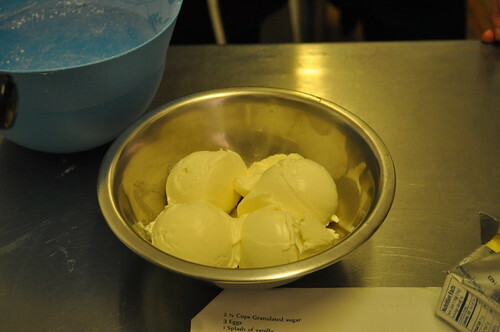 We combined the cream cheese and 1/2 pound of butter in the mixing bowl, mixing on medium speed for five minutes. After this, we mixed in 8 cups of confectioners sugar at low speed. Once combined, we added a splash of vanilla extract, mixing on medium for three minutes until smooth and fully combined. 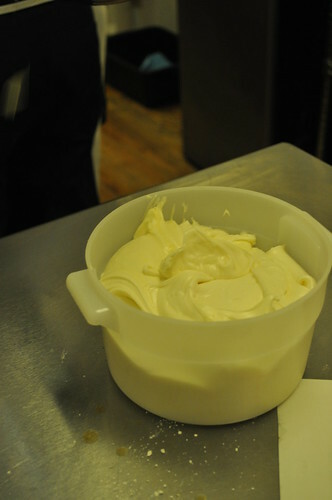 Here's our finished cream cheese frosting! And look at those cupcakes, right out of the oven! 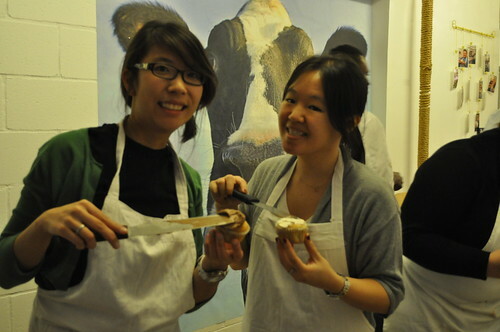 It looks like Team Vanilla made a few marble cupcakes, too--love that idea! Our class getting ready to frost/ice our finished cupcakes! Me and Alice waiting to frost the cupcakes! 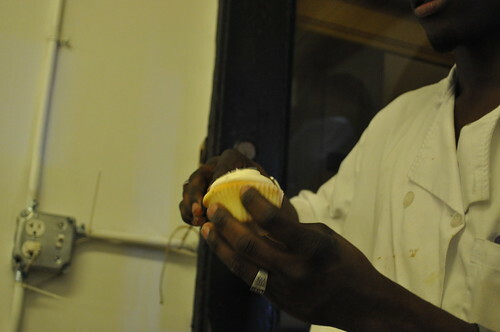 Butter Lane's master froster teaching us some the techniques used to create beautifully frosted buttercream cupcakes. Using a flat, flexible baking spatula, he told us to get a nice round shape (see photo above), then placing it at the center of the cupcake, dabbing as you turn the cupcake. Showing us the technique again. 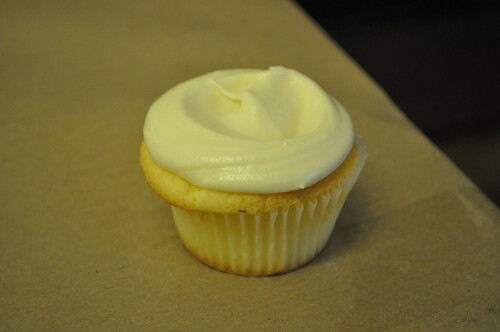 His end result--the perfectly frosted Butter Lane cupcake! My frosted cupcakes! I think I did a little better here than I did with the batter scooping. Alice's frosted cupcakes! Notice the one on the right is a "special ingredient" buttercream--the recipe isn't provided to the class as Butter Lane wishes to leave its "specialty" items a mystery! The class voted on pumpkin (we had the choice between that, raspberry, blueberry, and cinnamon, I believe), so there it is! The master froster also had a mini-competition for the students of the class--he said he would walk around to judge who was the best froster in the class. 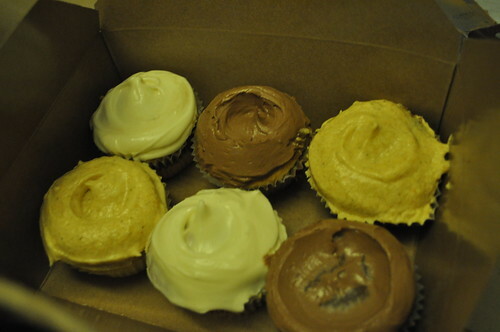 The winner would get a Butter Lane burlap tote in which to carry his/her cupcakes! Guess who won?! It was a tie between two members from Team Banana! Whoo! Go Alice! See above photo for the one of the winning cupcakes! The class frosting the last of the cupcakes. Me and Alice frosting some cupcakes. The finished products to be taken home and shared! 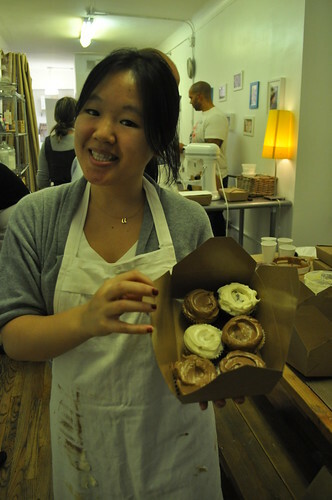 Alice with her finished cupcakes! Findings: I thought this class was great--very educational. I learned a lot about ingredients as well as baking techniques with regards to cupcakes. 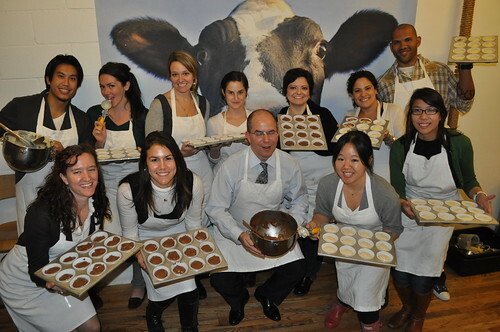 Plus, what a deal--a $25 comprehensive cupcake baking class that comes with a dozen cupcakes at the end! Score! I would still say that it is quite a deal as a dozen cupcakes normally at Butter Lane is $30 (cupcakes alone are $3 each), so really you are paying for a dozen cupcakes plus $20 for the class instruction. Nevertheless, this class is definitely great for team building, a night out with friends, a celebratory party, or even a date! And I promise you'll be in a sugar coma for the next few days, munching on those cupcakes, but no worries--it is well worth it :D! So keep an eye out for future Groupons! And thank you, Alice, for sharing this deal with me--I had a lot of fun! 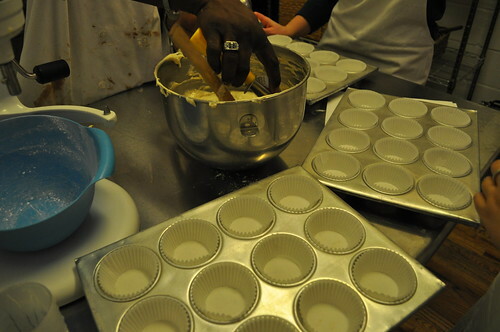 Price point: a two-hour cupcake class (and a dozen cupcakes) for $50; $25 with Groupon! 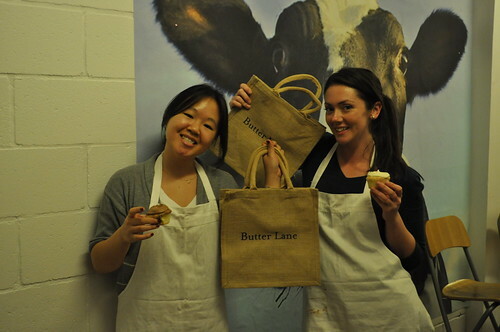 Butter Lane cupcake class deal available here*! * This deal is no longer available at the moment, but keep your eyes peeled! Sign-up for Groupon, and maybe they will offer the deal again soon. Since taking this class, I've seen Groupon offer the deal one more time, resulting in me purchasing an additional three more Groupons valid for three classes! Great tutorial! 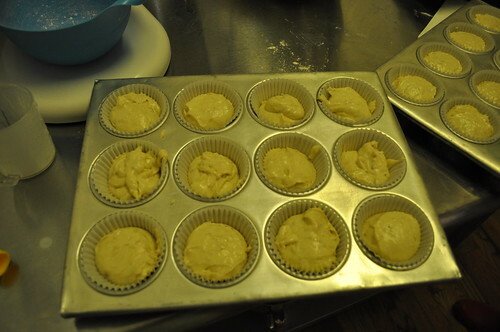 I made a half batch of the banana cupcakes last night, and they are FANTASTIC! I modified the cream cheese frosting, adding some local Grade B maple syrup (2 T) and chopped buttered pecans (1 cup), and the combination with the banana cupcake was OUT OF THIS WORLD!